With its six drawers with exquisite, hand carved, geometrical designs, this handcrafted, Spanish colonial style dresser is as beautiful as it is functional. The dresser is finished with a lovely, light stain, and its large, open table top is very practical. The drawers are designed in various sizes, with the two largest drawers being centered in the dresser. 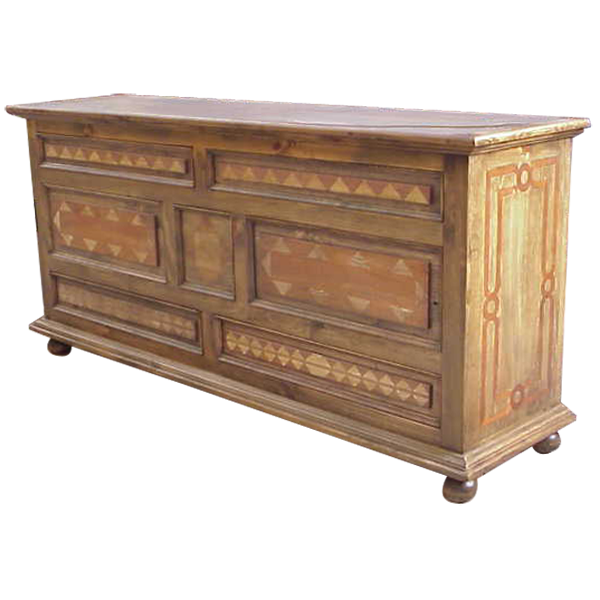 Each drawer is embellished with spectacular, hand carved, geometrical designs. There are also rectangular, decorative panels on each side of the dresser. The top and bottom rim of the dresser have classic, straight molding, and it rest on hand turned, bun style feet. Made with the best, sustainable, solid wood available, it is 100% customizable.